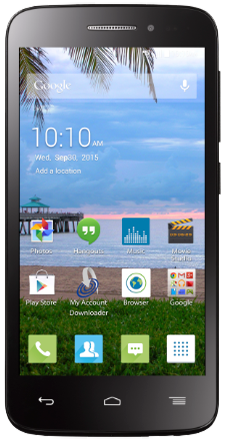 Alcatel OneTouch Pixi Charm is a 4.5-inch device that comes running Android 4.4 KitKat. The device also has a powerful quad-core processor that will ensure you achieve all your daily tasks. The Alcatel OneTouch Pixi Charm is a GSM phone that will be activated on AT&T network, before ordering be sure to check that you have AT&T cell towers/coverage in your home area. Let's find out more about the gadget as we go along in this review. The Alcatel OneTouch Pixi Charm is a prepaid mobile phone available from the Straight Talk or Net 10 Wireless websites. In the purchase box, you will find the phone, battery, a wall adapter charger, activation card, service guide and quick setup guide. The initial setup phase is a straightforward phase that takes about 5 minutes. Alcatel OneTouch Pixi Charm has a typical design as seen in most Alcatel phones so do not be expecting anything out of the ordinary. To start off, it's a 4.5-inch device, so you get a 4.5-inch touchscreen. To the upper part of the display, we have the earpiece and front facing camera. On the lower part of the display, we have the physical navigation keys. The arrangement is such that; the back key is on the left, the home key in the middle and the menu key on the right. On the frame of the device, we have the volume rockers and power button on the right edge. The left edge has no button whatsoever. The bottom edge hosts your microphone as well as a microUSB connector. The top edge has the headphone jack and the noise cancellation mic. On the upper part of the back cover sits the camera with its LED flash and hands-free speaker on the lower part. The back cover is not fixed since the device comes with a removable battery. You also get access to the SIM and microSD slots when you remove the back cover. That sums up our tour of the device layout, so moving on to the device features. The resolution of the cameras on the Alcatel OneTouch Pixi Charm is average as you would expect from a lower end device. It comes with a 5MP rear camera and a 0.3MP front-facing camera. The back camera takes pretty decent photos and it even has a LED flash to cater for low light environments. The front camera, though low on pixels, comes in handy during video calling. Both cameras do have some nice features. They provide for direct sharing once a photo has been taken by showing your most used sharing apps like Gmail, WhatsApp, Bluetooth, etc. The back camera has several capture modes such as panorama, sports, night, filter, timer, and picture size that you adjust or turn on in the Manual mode. For an entry level phone, the camera gets the job done, and I didn't find any issues with it. One thing you will enjoy on the Alcatel OneTouch Pixi Charm is the battery life. The phone ships with 2000mAh battery which may appear to be small in capacity until you start using the phone. It gives you 17 hours of talk time and 28 days of standby. This is a phone that will keep you connected throughout a full work day and still have some juice left, that's if you are a normal user. Even during intensive operations like internet browsing or gaming, the battery sustains the phone for close to 6 hours. The battery can be removed so you can always have a spare battery if your primary battery runs out. The phone comes with a 4.5-inch fully touch TFT display. It gives you a resolution of 960 x 540 pixels. For an entry-level device, I found the device to be considerably bright. This being a Quad High Definition screen, photos and videos show up with good quality. The display is very responsive to touch hence perfect for movies and games. While indoors, the device is very bright and you will see all items on the screen clearly. It dims in bright sunlight, but that is expected from devices in this price range. Alcatel OneTouch Pixi Charm ships with an internal storage of 4GB which gives you only 2GB of user memory. This is quite small if you consider installing apps, downloading music and storing your photos on the device. The nice thing about the phone is that it has a microSD card slot that supports up to 32GB of storage space. With an SD card installed, you will have ample space to have all your files on the phone. The Alcatel OneTouch Pixi Charm performance is considerably good when compared to other phones in the same price range. This is because it has some powerful features installed. Consider its powerhouse; a 1.5GHz quad-core paired with 1GB of RAM. These are pretty mid-level specifications as you will find some phones in this range coming with dual-core processors and even less RAM. With a quad-core processor and 1GB of RAM onboard, multitasking can be achieved, the device is very responsive to touch, and some nice animations can be seen as you navigate through screens or switch through different apps. The phone is also 4G LTE enabled which I found to be very impressive. Browsing speeds are incredible. YouTube loads with no noticeable buffering and even live Google Maps Navigation is an enjoyable experience as location data populates on the screen in microseconds. No one enjoys waiting on a device to load, with the Alcatel OneTouch Pixi Charm, you won't wait for a website page to load. The phone also has Bluetooth 4.0, Wi-Fi, GPS for navigation, and Hearing Aid Compatibility. Camera: 5MP back camera. 03MP front camera. Battery: 2000mAh Li-polymer removable. Talk time up to 17 hours. Standby up to 28 days. Internal Memory: 4GB ROM. Has support for an external microSD card of up to 32GB.